When you make mistakes in business the cost is often extremely high. Uber, a company that has made a series of bad business decisions over the past twelve months on issues concerning everything from workplace sexual harassment to the handling of local law enforcement authorities, reported a $708 million loss in the first three months of the fiscal year. While Uber claims to not be concerned, the message is clear: There can be a big price to pay for making bad business decisions. 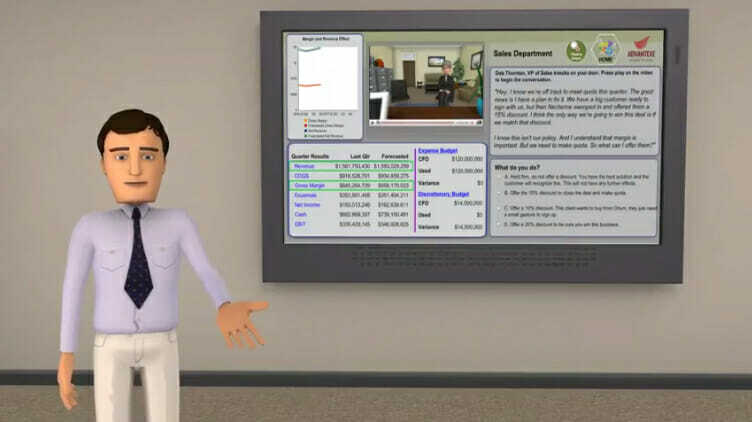 This is also precisely the message that Advantexe Learning Solutions is hoping to convey through its new online game, The Drivers of Business Performance. In recent years, Advantexe Learning Solutions has gained a solid reputation in the eLearning industry for producing business simulation-centric training.While simulation-based training is often associated with other sectors, especially the airline industry (where simulations are used to train pilots) and medicine (where simulations have long been used to train doctors to perform risky procedures), Advantexe insists there is also a place for simulation and gamification in business training. The company has also found that the need for more robust business solutions is pressing. In one recent survey of 250 employees, they discovered that only only 24% felt comfortable holding a business dialogue, only 27% understood how their company made money, and only 19% know and fully understand their company’s strategy. As described on Avantexe’s site, in the game, players take on the role of interim CEO of Orium, Inc. a multi-billion dollar global SaaS-based technology company. Stepping into the role of CEO, learners are responsible for boasting sales numbers, improving profitability, and setting the company up success over time. The board of directors has given the CEO a strict budget, so learners must also learn to manage a budget and lean on key members of their team to make smart decisions. Specifically, The Drivers of Business Performance immediately shows the cause and effect of business decisions, has the capacity to graphically illustrate a company’s financial flows in real time, can highlight data and insights concerning profitability and cash flow, and features direct interactions with simulated characters to make learning both fun and realistic. Every business is unique, and this means that different decisions impact different businesses on different levels. For this reason, Advantexe also offers subscribers ways to modify The Drivers of Business Performance simulation to better reflect their specific organizations structure and needs. In addition, the game ca be delivered both online or as par to a live business learning seminar. Whatever the mode of delivery, however, the game is already gaining attention from employers looking for ways to ensure that all their employees have a sharp understanding of how organizations work and how their decisions on the job, including their interactions with customers and decisions about security and compliance issues, impact the bottom line. Advantexe’s latest entry demonstrates how gamification and simulations can play a key role in meeting the complex training needs of businesses.